Next week is Valentines Day. If you get you Love Something Unforgettable, it’ll make both of you Very Happy! The Master, Jack Bairian began his career in the jewelry industry many years in high school, where his passion for detail and design blossomed during his time in pottery and jewelry design classes. He worked behind the scenes at major jewelry retailers for 25 years, producing brilliant custom pieces for thousands of people worldwide. His passion for making your Dream Piece is his mantra! Bring your ideas to Jack and he’ll make them into reality. 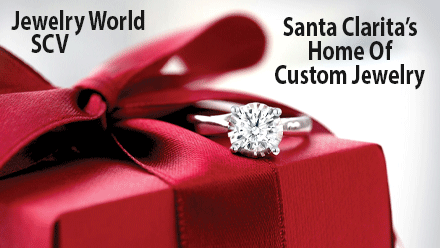 You’ll never go wrong with a One Of a Kind piece of Custom Jewelry from Jewelry World in Santa Clarita. There are rings, pendants, earrings, bracelets and more ready to go. We have Hundreds of Custom Pieces Available for immediate purchase, and if it’s for another special occasion – Jewelry World is the place that came make dreams come true!